*Disclosure: I was given a free copy of the book, “Beautiful, Desert Pots” in return for my honest review. 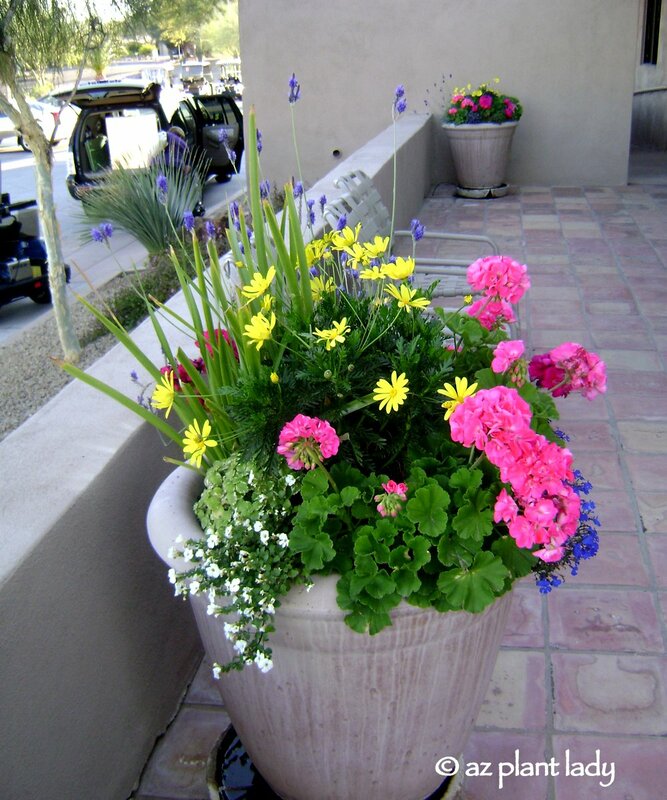 In the desert, we are fortunate to be able to grow plants in containers throughout the entire year. 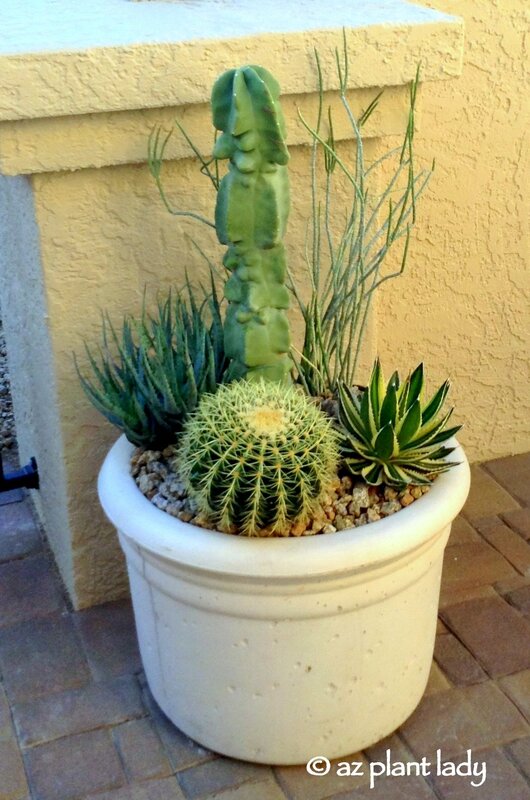 Of course, living in the desert does bring along its special challenges when it comes to gardening and growing plants in pots is no exception. However, with the right pot, location, planting mix and plants – it is possible to grow a perfectly lovely container filled with thriving plants. I like to think of potted plants as a way to decorate your outdoor space with both color and texture. They also offer the flexibility to change out plants easily for a different look as well as the ability to move the pots around to new locations. A pot filled with plants is nothing short of a miniature garden in a confined space. I hope that these photos of lovely potted gardens help to inspire you to get out there and create your own. 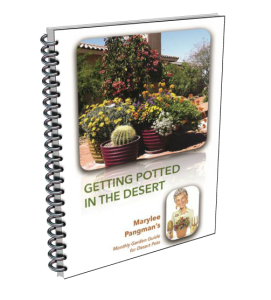 To help get you started, I highly recommend the book, “Getting Potted in the Desert”, written by Marylee Pangman, Tucson resident who has over 20 years of experience growing potted plants in the desert. She is a certified Master Gardener and ran her own company, “The Contained Gardener”, where she designed and maintained container gardens for clients for years. Susan aka ‘Gardening Granny’, you are the winner of this fabulous book! 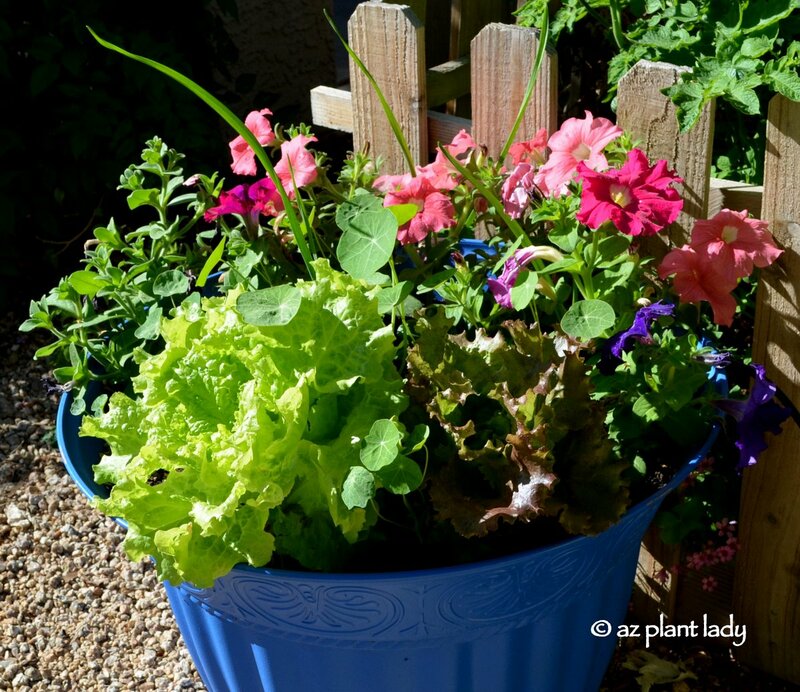 Thank all of you who entered and let us know what you like to grow in containers. If you didn’t win, you can still order a copy of this book for yourself or a friend who loves to garden. Click here to be directed to the ordering page. As summer begins to slowly fade and the heat begins to dissipate, the Southwestern garden comes alive. Plants perk up in the absence of 100+ degree temperatures and people begin to venture outdoors (without their hats!) to enjoy their beautiful surroundings. When people talk about their favorite season, many will tell you that spring is the time that they enjoy the most as their gardens come alive, spring forth with new green growth and colorful blooms. While spring is a glorious time in the desert landscape with winter blooms overlapping with spring flowering plants along with cactus flowers – it isn’t the only ‘spring’ that the desert experiences. Fall is often referred to as the “second spring” in the desert Southwest as plants take on a refreshed appearance due to the cooler temperatures with many still producing flowers. Many birds, butterflies and other wildlife reappear during the daytime hours in autumn. Desert residents often find themselves making excuses to spend more time outdoors whether it’s taking a longer walk or bringing their laptop outdoors where they can enjoy the comfortable temperatures and surrounding beauty of the landscape. Fall is also a time where we take a look around our own garden setting and decide to make some changes whether it is taking out thirsty, old plants replacing them with attractive, drought tolerant plants or creating an outdoor room by expanding a patio or perhaps adding a pergola. No matter where you live – the East Coast, Midwest, Northwest, etc., fall is the best time of year to add new plants to the landscape as it provides plants with 3 seasons in which to grow a good root system before the heat of the next summer arrives. **Thinking of making some changes to your landscape? Click here for a list my favorite drought tolerant plants that provide fall blooms. The women’s ministry at Cornerstone Church in Chandler, AZ asked me to speak about desert gardening. Now, I love talking about how easy it is to have a beautiful and low-maintenance garden in the desert – yes, I said easy. – Not allowing plants enough room to grow, which leads to over-pruning. – Pruning plants more often then they need it. – Selecting plants that aren’t well-adapted to our climate. – Using fertilizer on plants that almost never need to be fertilized. The event begins at 7:00 with the main speaker and afterward, attendees are given the choice of going to one of several ‘labs’ being offered at 8:00 pm. I will be heading up the lab, “Creating a Beautiful, Fuss-Free Garden”. The main speaker, is Lysa TerKeurst, who is fabulous. And, did I mention that the entire event is FREE??? There is no need to register. Just show up. Here is a link for more information. I’d love to those of you who live in the greater Phoenix area! On another note, I have been talking about attending plant sales and sharing with you about new varieties of some popular plants available along with a few of the newest plant introductions. I had mentioned that I had come away with 3 new plants from the Desert Botanical Garden’s Spring Plant Sale. 1. The first plant I chose is one that I have never grown before – Red Powder Puff (Calliandra haematocephla). As indicated on the plant sign, it is new to the market. It is related to Red & Pink Fairy Duster shrubs, (which are great plants for the desert landscape, by the way). I was entranced by the photo of large, puff-ball flowers. I also liked that I could grow it as a small tree, if I wanted too. I like that is hardy to 20 degrees, which should make the occasional dips into the low 20’s in my garden no problem. I planted it along the eastern side of my backyard, against a patio pillar. It will receive morning sun and afternoon shade. Growing to its right is a 15 ft. tall Mexican Bird-of-Paradise (Caesalpinia mexicana) that I’ve pruned into a tree form. So, I think that they will look great next to each other. The next plant I chose is Mexican Bush Sage (Salvia leucantha). Years ago, I planted this shrubby perennial in a parking lot of a golf course I worked at. It did beautifully and attracted hummingbirds. It would die back to the ground every winter, but quickly grew back in spring. I have also seen Mexican Bush Sage grown in a variety of other areas during my travels, including Santa Barbara, CA and Miami, FL where it is grown as a perennial. During a tour of the White House in Washington DC, I saw it grown there as well, where it is treated as an annual. As much as I have liked this plant, I’ve never grown it in my own garden. I planted it against the outside of one of my vegetable gardens where it will get morning and early afternoon sun. Two other factors were important in choosing this area for my new Mexican Bush Sage – I didn’t have to add drip irrigation for it because it will get residual moisture from the vegetable garden AND it will also attract pollinators to my vegetable garden. The last plant that I chose is one that many of you may be familiar with, just with a different flower-color. Purple Autumn Sage (Salvia greggii ‘Purple’) was evidently a very popular plant at the sale because there was only one left, which went home with me. It will grow much like the red variety, pictured above, enjoying filtered shade or afternoon shade. Flowers will appear in fall, winter and spring in low-desert gardens. Other varieties of Autumn Sage are available with different-colored flowers like white, pink and salmon. My new Purple Autumn Sage is also happy in its new home outside the vegetable garden where it will receive afternoon shade. I will keep you updated on how well they grow in my garden. What Do Tomatoes, Starbucks and Christmas Have In Common? Does the fact that Christmas is fast approaching make you think of growing tomatoes? Of course not. Our thoughts are focused on making sure our homes are decorated for Christmas, looking for the perfect gift for that special someone and hopefully some holiday baking. But, I am going to tell you why you should also be thinking about growing tomatoes this time of year. But, did you know that December is the best time to start growing your tomatoes from seed indoors? For those of you who have grown tomatoes in the arid desert, know that our tomato growing season occurs in spring and fall. Oh, your tomatoes will live through the summer with a little shade – but they will stop producing new tomatoes once temperatures hit the 90’s because their pollen is not viable. The other limiting factor is that you can’t set out tomato plants into the garden until the danger of frost is past, which is usually around the beginning of March in the Phoenix metro area. So, to get the most tomatoes, you want to plant the largest (oldest) tomato plant you can in early March. Many nursery greenhouses are starting their tomato plants from seed right now where they will grow, protected from the elements until March arrives when you will find them on the shelves of your nursery. You may be wondering why you should start your own tomato plants instead of buying them at nursery? Well the problem with purchasing your tomato plants from the nursery is that they have a very limited selection of tomato varieties. And, they may not have the variety you want, or it is sold out. **Right now, many seed companies are having Christmas sales on their seeds including Burpee and Botanical Interests. Growing your own tomatoes from seed is very easy and rewarding. I like to use Starbucks coffee sleeves or toilet paper rolls, cut in half as my seedling containers. 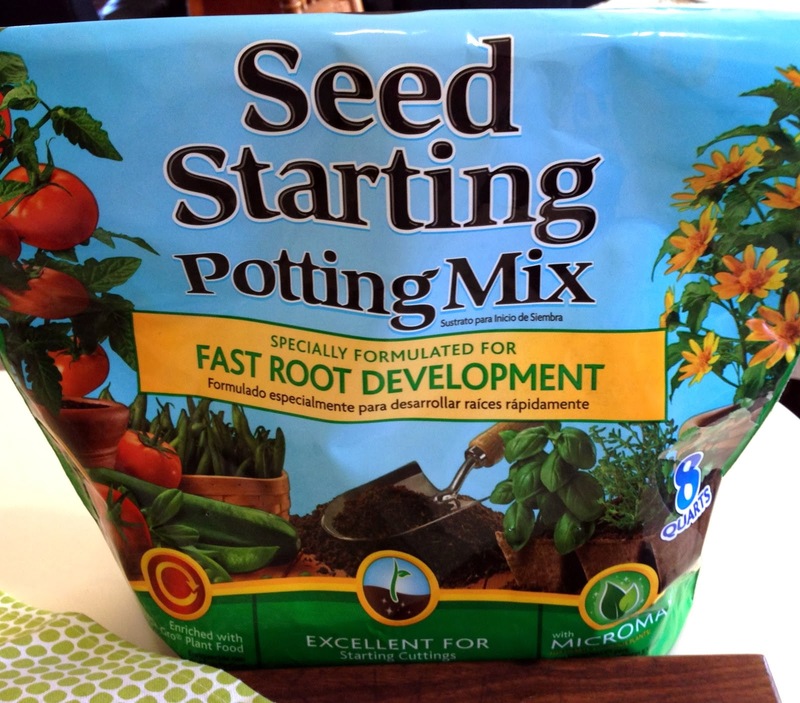 Grab some seed starting mix from your local nursery or big box store. Some seed mixes have fertilizer already added. If not, then I recommend adding a slow-release fertilizer to your potting mix. Wet the soil before adding to your containers. Fill your recycled containers with the seed mix and add your seeds. Place your newly planted seeds in a warm area, such as the top of your refrigerator. The heat will help them to germinate. **Use a spray bottle to keep them moist. Don’t allow the soil to dry out. Once the seeds begin to sprout, put them in front of a sunny window. In just a few weeks, you’ll be surprised at how quickly your tomato plants will have grown. During warm winter days, you can place them outdoors to get a little extra – but be sure to bring them indoors at night until the danger of frost is over. As your tomato seedlings grow, you can transfer them to larger containers until you are ready to put them out in the garden. *For more information on seed starting, click here. https://www.azplantlady.com/wp-content/uploads/2013/12/885.jpg 480 640 arizonaplantlady@gmail.com http://www.azplantlady.com/wp-content/uploads/2018/10/favicon.png arizonaplantlady@gmail.com2013-12-09 19:11:002016-10-26 14:36:01What Do Tomatoes, Starbucks and Christmas Have In Common? You know, every month seems to fly by before I think about what I should be doing in the garden. Is it that way for you too? I mentioned in an earlier post that I am busy writing garden articles that will be published in November. So my brain is thinking of all the things to do in the garden….in 3 months. So, the fact that I have August tasks that need to be done in my garden is somehow forgotten. If you have citrus trees, they should receive their third application of fertilizer towards the end of this month (or the beginning of September). 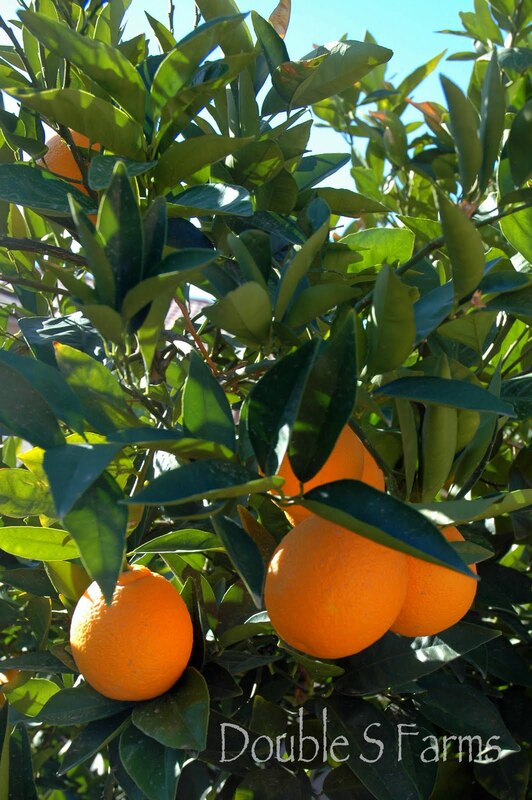 Established citrus trees should be fertilized three times a year – in March, May and August/September. You can read more about citrus fertilization here. The orange tree, below, belongs to my father-in-law and he loves to share the oranges with the grandkids. Some vegetables can be planted now as well, including cucumbers, sweet corn, carrots, lettuce, green onions and squash can be planted from seed. It is still a bit early to set out transplants. If you are a fan of palm trees, this is a great time to plant one. Palms should be planted during the summer and not during the winter if at all possible since they actively grow when it is warm. Don’t add any amendments to the soil. If additional drainage is needed, you can add some sand to the hole. You can also fertilize your palm trees this month as well, using a fertilizer specially formulated for palm trees. Palm fertilizer contains certain micro-nutrients that palms require and are often missing in more conventional fertilizers. Palm trees should be fertilized during the warm season only since palm trees will not take up fertilizer during the cooler months. You know what? I must admit that I have been putting off getting out into the garden. Mostly because by the time August rolls around, I am a bit tired of the summer heat. So, I think that I will end my “August To Do List” at this point. Of course, if you want more to do, you can always lightly prune back your overgrown shrubs or perennials – but only by 1/4 – 1/3. Okay, I know that I have been hinting at my big announcement for quite a while now. But, I am so thrilled that I can finally reveal what I have been working on. Some of you may already know that I write the Southwest Regional Report for Birds & Blooms magazine. Well, the editors decided a while ago to create a blog that is broken up by geographical regions. They asked me to write their Southwest blog, which premieres today! I am so excited about this new adventure since the topics will cover gardening as well as birds. I will also highlight local events as well. The Southwest blog will cover Southern California, Arizona, Nevada, New Mexico and Utah. So, in many ways, this new blog will expand on the primarily gardening topics that I cover in my personal azplantlady blog. Even if you do not live in the Southwest, I do hope that you will stop by the blog for a visit. The editors would like for this new blog to be interactive and I would appreciate it so much if you would read a few of my posts and leave a comment. My hope is however, that you will want to stop by and visit much more often. I will have a link to my Birds & Blooms blog on azplantlady, in order to make it easier to read both blogs. https://www.azplantlady.com/wp-content/uploads/2011/03/Female-Anna27s-in-flight-1.jpg 635 640 arizonaplantlady@gmail.com http://www.azplantlady.com/wp-content/uploads/2018/10/favicon.png arizonaplantlady@gmail.com2011-03-01 14:00:002016-10-26 14:36:42Special Announcement!